Mai Chau - Vietnam bicycle tours: cycling and biking in Mai Chau. Mai Chau valley is a perfect place to experience Vietnam's village life in a remote setting. Mountain bikers will love this trip for the variety of trails - from good single track paths, undulating rough jeep trails to some climbs that are rewarded with ultimate descents. The ride passes through many villages, across lush rice paddies and above a valley for stunning views. This tour takes us into the countryside where we will encounter the. We'll get to know the local hill tribe people - the White Tai - and their culture better when we overnight in local home stay. After a day or remote cycling you will be rewarded and spoilt with dinner and a night at the lovely Mai Chau Valley View. The next day the rewards continue with a mostly downhill ride before transferring back to Hanoi. From the hotel we drive to Poom Coong Village for a short ride through White Tai villages. After lunch at a traditional house, we continue on single track and undulating jeep trails around terraced rice fields to overnight at Buoc village. Today's ride is remote and challenging. We cycle above the valley and look down on small hamlets before cruising back down to Mai Chau for the night at Mai Chau Valley View. We cycle on single track through the valley to ethnic villages, crossing wooden bridges and rolling through rice paddies before a transfer to Hanoi, where we gather one last time for a farewell dinner. Mai Chau offers gorgeous scenery, a beautiful valley surrounded by mountains and a great look at rural Vietnam life in the rice fields, outstanding food and the ride is not too strenuous. We had a wonderful time and would definitely do it again. The scenery was stunning, and we felt like we had a real Vietnam experience. Our guide Cuong was knowledgeable, friendly and accommodating. The food was very very good and all the home stays/hotels were comfortable. It was absolutely fantastic. We enjoyed every minute of it and Peter (Trong) really made it for us. His knowledge, care, and organizing skills were outstanding. One of the best things we have ever done. Suitability: This trip is suitable for people who are fit, have off-road experience, and enjoy a mountain bike challenge in a beautiful environment. Of course, water, soft drinks and snacks are all included every day and SpiceRoads supplies a quality bike and helmet. The trip is fully supported by our air conditioned minibus. Biking Conditions: We ride approximately 75 km, mostly on off road tracks, that vary from hard packed jeep roads to single-track. This is a moderately challenging mountain bike trip with climbs to stunning views and spectacular descents. Our guides are knowledgeable on the local area and customs, and they explain the history, culture, and local way-of-life each time we stop. After an early pick up from your hotel we’ll drive to Poom Coong village just before lunch time. A short warm up ride through some White Tai villages should build up your appetite for a home cooked lunch at a local traditional house. After lunch we’ll cycle to the Tai village of Cun Pheo on a mix of good single track paths and undulating rough jeep trails. 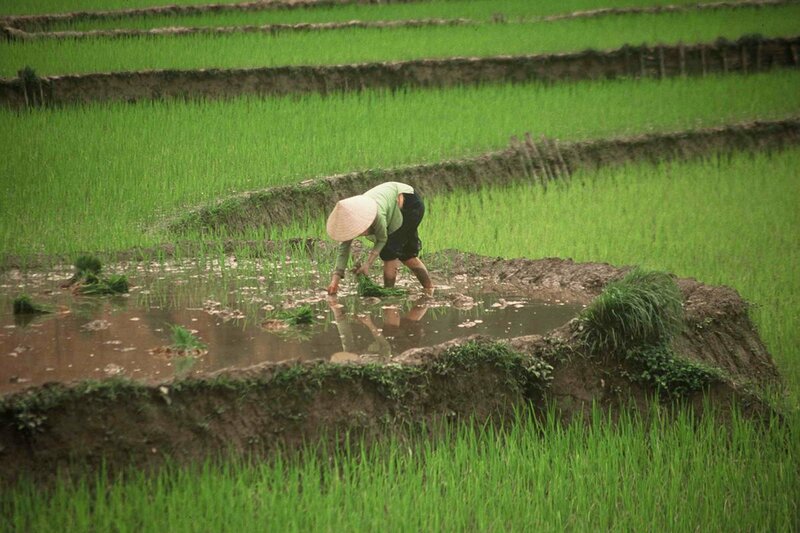 The views are stunning as the ride passes through many villages and across lush rice paddies. Unique to this area are fan palms, grown specifically to use for roofing. We’ll pass hot springs, cycle across suspension bridges and follow the contours around beautiful terraced rice fields. On arriving in Cun Pheo village the rest of the afternoon is at leisure to wander by foot or explore the village trails further by bike. Dinner and overnight in local village home stay at Buoc village. Today’s ride is more remote and challenging, though there is plenty of opportunity to stop, rest and admire the views. After breakfast enjoy relatively easy biking on rolling terrain for the first 7 km, then the trail begins to climb uphill - steep in parts, undulating in others. Rise above the valley and look down on small hamlets, feel and hear the forest surroundings as the trail snakes up and along the mountainside. Stop for a siesta in a Tai village house, a welcome relief from the heat - before tackling the last few kilometers to the top of the pass. Cruise a final 11 km downhill to Mai Chau. The tracks will vary from hard packed dirt roads to single track, with a few challenging rocky sections thrown in for variety. For those needing more challenging biking it will be possible to cycle further. After breakfast, and perhaps a quick walk up to a temple, we pick up our bikes and cycle back on the scenic route to Mai Chau, past green rice paddies and local villages, meeting the friendly local villagers. Arrive back in Lac village in time for lunch in a local home stay. We’ll have some time to explore the village, perhaps to do some shopping of the local handmade textiles. Transfer 2 hours to Hanoi, arriving late afternoon.